The casino was established in 2016 and is under the management of Cassava Enterprises. The casino has over 200 casino games provided by big names like NetEnt gaming providers. The casino has also been licensed by the United Kingdom Gambling Commission and Gibraltar Regulatory Authority. 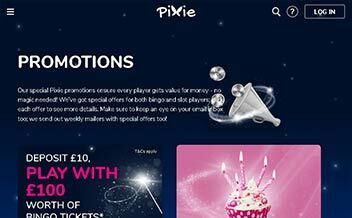 Pixie Bingo has always strived to ensure that players get to enjoy their casino experience. By offering a vast list of amazing casino games to cater for its vast client base. Players are given welcome bonuses and existing players are constantly awarded promotions every day. The casino offers an impressive list of progressive casino games. The players get an opportunity to make money and still have fun at the same time. Some of the progressive jackpot games include; Once upon a Dime, Shaman’s Dream, a Nightmare on Elm Street and Double Ducks among others. Pixie Bingo casino has the best variety of slot games. The gaming providers have provided a good number of slot games which have different types of themes to make the experience more amazing. Some include; Tornado, Flowers, Giant Gold, Jewel Journey, Steam Tower, Jack Hamer and Spinata Grande among others. The table games fans are surely not left behind. The variety of table games available in this casino is impressive. The players get to enjoy these table games: European Roulette, Keno, and French Roulette. The casino has no live dealer games at the moment. This offer is only available to the United Kingdom players who have opened an account at the casino. The minimum deposit required is £10 to claim the Scratchcard bonus. The prize is paid after fourth eight hours after a win. The wagering requirement is 4x on bingo games bonuses while an 80x wagering requirement for slot games bonuses. This bonus offers players 6 free tickets for £1000 fountain game. Players need to make a £10 deposit into their accounts then buy 30 bingo tickets and use up £10 bingo tickets on Tornado Escape and finally refer a friend. After doing all these you get a chance to win £20 bingo bonuses on Pixie Dust. 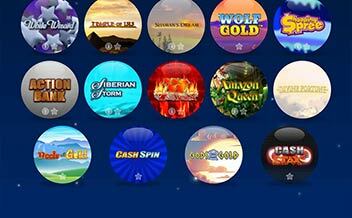 All bingo bonuses have a wagering requirement of 4x before making any withdrawals. The casino has a VIP club for frequent players and loyal customers. This club has 4 main tires which include; Pixie which has 10 free spins and free bingo, Elf which has 20 free spins and free bingo, Fairy which has 40 free spins and free bingo too and finally Unicorn which has 80 free spins and free bingo. The casino is always adding new features. There are always new promotions and new bonuses to entice regular casino players. Therefore, for every player, it is important to be up to date with the casino’s news. This section has been put aside to keep regular or new players updated. The casino is accessible on various platforms. These platforms have an impressive list of casino games and the software providers have ensured that all players preferences have been taken care of. The slot games, for example, have different themes to make the gaming experience more fun and interesting. The software providers include; NetEnt, IGT, Eyecon, Aristocrat, Gamesys and Random Logic to mention a few. Pixie Bingo has a number of restricted countries they include; The United States, Antigua, Belgium, Italy, France, Israel, Turkey, Spain, Denmark, and Gibraltar among others. 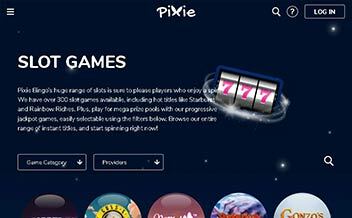 Pixie Bingo Casino is accessible on various platforms. Players can access the casino games on desktops, tablets or mobile devices. The casino also supports various operating systems like; Android and IOS. The casino is accessible on; Opera Mini, Mozilla Firefox, and Google Chrome to mention a few. The casino’s web version has a good interface that is indeed easy to navigate. The casino games and the casino promotions are clearly shown on the web page. There is also an FAQ section where players get to access the frequently asked questions, the customers support section has been put under one section which is ‘Help’. The light green color on the site is surely too attractive to miss. The desktop version has an almost similar layout as the web version. The desktop version has over 500 casino games. Players get access to the casino while at home. This version supports a number of operating systems. The casino is also accessible on mobile devices. Players get to enjoy the casino games on the go. The phone display is really small. The casino values the privacy and security of its players. The casino uses an SSL encryption to keep players’ information secure. The casino games have also been proven fair play by ECOGRA and are licensed under the United Kingdom and Gibraltar jurisdictions. The Pixie Bingo customer support is by far the best in the casino industry. Players get 24/7 access to the casino support. The casino offers a live chat, telephone and email address to be able to efficiently take care of their client’s queries in good time. Pixie Bingo Casino has for sure strived to make players have a good gaming experience throughout the years it has been active. The list of games available is amazing and the welcome bonuses are surely hard to pass. Players also get to enjoy access to customer support 24/7 and play the casino games on mobile devices. 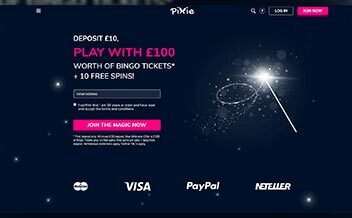 If you are looking for an online casino that will change your gaming experience, then look no further because Pixie Bingo is the place to be. Open your account make your deposit, claim your bonus and change your casino experience today!